Starblastio as many other shooting and space battle.io games, incorporates multiplayer functionalities. 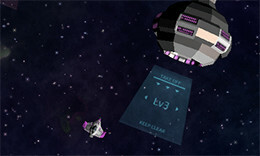 You commence the game with a minimalistic spaceship. All game participants start the game neutral but they can get hold of their own spaceships by mining points or destroying other spaceships. You being at a lower or base level increases your outcomes of being destroyed in the battle field. So, it’s but logical not to attack your allies before your spaceship has attained a certain degree of authority or strength. You can mine points by crushing the stones in space. These points can be utilized to upgrade the features of your spaceship. These upgrades are further divided into 4 categories which incorporate: ship, bullet, power and shield. You may as well upgrade levels of regen, capacity, agility, damage and speed. The more you upgrade your spaceship’s level, the bigger your spaceship becomes in terms of appearance and size. Nevertheless, players can make use of the mini map to spot the whereabouts of their allies in the game. There are basically 2 preferential control combinations in the game. The first input combination entails using spacebar to shoot enemies while displacing your spaceship with the arrow keys on the keyboard. The second input combination requires that you to move the mouse cursor while holding down the right mouse button to displace your spaceship and firing at things using the left mouse button.